We prefer that you now make all payments to us by electronic banking. Please include your surname and first initial as part of the reference. Please note that if you pay the monthly tasting fee by electronic banking, then you still need to book your places by e-mail. Our AGM was held on Wednesday 13th February 2019. Each month we need three or four volunteers to pour the wines at our tasting. We have a loyal group of pourers who offer to help. But it’s not fair that they have to do this too often. For this reason, we are always keen to see other members take their turn at pouring. If all of our members volunteered, then you’d each only have to pour once every two years! So, don’t wait for Brian to ask you! Go and see him at the start of the tasting and he will be very pleased to accept your help. Thank you in anticipation. We thanks our volunteers who help by providing cheese for the monthly tastings. Wine is obviously the star of the show, but cheese is a great support act and contributes to the whole ambience of the evening, so your time and efforts are much appreciated. The Whitewater Valley Wine Society has an excellent formula for working out quantities of the cheese /bread needed per tasting, based on the numbers of attendees expected. Volunteers will be contacted and given the numbers attending on the Sunday before the tasting on the following Wednesday. The cost of the above will typically be around £30 to £40, depending upon numbers. This should be reclaimed from the Treasurer at the tasting on production of receipts, so please keep them. The room is available from 7pm. As there are no kitchen facilities, please slice the bread, drain the olives and cut up the cheese in advance (some shops will dice the cheese if you ask). It is a mandatory health and safety requirement that disposable gloves must be worn when preparing and serving the food. There should be a supply of gloves (blue Nytrile) in the food bag – if not, please purchase and reclaim. Please reserve half of your provisions to replenish tables during the break ready for the second half of the tasting. – Napkins (if not sufficient in bag); enough for all the attendees, plus speaker, plus about 8 extra for the bread baskets. – Large freezer bags / Ziploc bags are included to transport prepared cheese and sliced French bread sticks to the venue. Cheese and wine friends forever. The Society aims to provides a basis of a good Cheddar, and a creamier Leicester or Double Gloucester to support the tastings. Feedback I have received suggests that members, whilst happy with the cheese provision, would like a bit more variety on occasions. We are a little restricted in the choice of cheese because many of the wine presenters do not want blue cheese served with their wines. Brie and Camembert by their nature pose a few problems for pre-preparation and serving, so they are avoided. Please do not feel under any pressure to change the current system, however if you do feel a bit creative………. Alongside our base of Cheddar / Gloucester we could provide a “guest cheese” which we feel could complement the wines being tasted. We do not know which wines the speakers are presenting, but we could look at their theme and choose a cheese which would accompany some of their wines. A quick rule of thumb when pairing cheese with wine is to is provide cheese from the same country or area where the wine is produced. 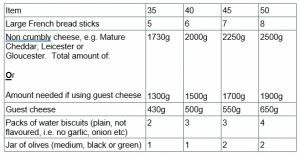 In the table below are some suggestions of cheese which could be served with different wines and still meet our criteria of being easy to prepare, portion, serve and transport. The GDPR replaced the existing Data Protection Act on 25th May 2018. Clubs and societies are included within the regulation. 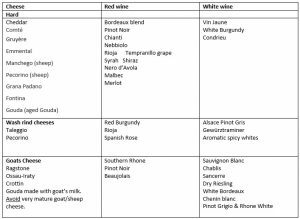 The following information tells you what data the Whitewater Valley Wine Society holds about its you and what we do with it. The data we hold about members is your name, phone number and e-mail address. We do not hold postal addresses. We also hold name and e-mail address for non-members who have told us they wish to be kept informed about our tastings and events. We use the data we hold to send you the monthly newsletter and to contact you for Society purposes as necessary. We keep the data we hold about you secure and our electronic files are password protected where appropriate. We do not share the data we hold about you with other members or with anyone outside of the Society, unless you have given us your specific permission to do so. If you have any questions or concerns regarding the data we hold about you or how we use it, please contact Secretary Keith Cooper.